Glasgow is Scotland’s largest city with more than two million people within a commutable distance of Spectrum’s office spaces spread throughout Glasgow. Within the City Centre and surrounding districts is a vibrant business community. Our office locations are available in city centre locations, business hubs providing networking potential, support for growth and all easy to reach by car, rail or bus. Where are our offices in Glasgow? Do you need Office Space in Glasgow? Need help finding or choosing an office? 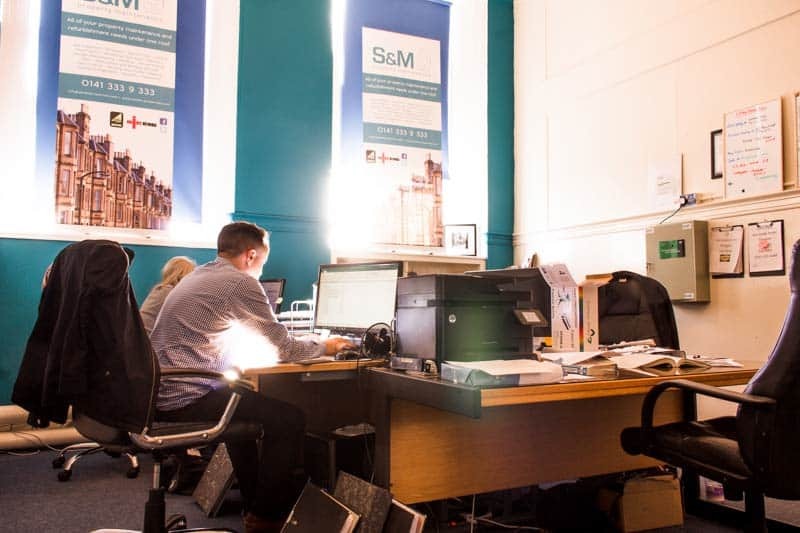 As one of Glasgow’s largest family-owned commercial property businesses, we provide bespoke office space solutions to meet the needs of any business… regardless of the size of current and future staffing levels. We have a huge variety of office spaces available ranging in sizes from 50 sq. ft. to 2,000 sq. ft. Services can be included, with or without office furnishings and always on flexible lease terms. Our terms are always flexible. We understand the need for business tenants to minimise long-term financial commitments. Our lease terms can be arranged on a short or fixed-term basis with renewal options rather than a long-term lease with break clauses. If you grow in size (as we hope you do) we can provide you with a variety of office accommodation options ensuring there’s never a scenario when your staff are working in too crowded a workstation, which could affect your businesses productivity. We are family owned and operated and have been providing commercial property solutions for businesses across Glasgow since 1988. Our expertise is second to none and our advice is all part of the service. Benefit from our two decades of commercial lease expertise. Our success is because of our clients’ success, and we work to help businesses succeed by providing the right location, at the right price on the very best terms – Every Time! ✔ You Get Our Best Price Guarantee! We provide premium office solutions at the most competitive rates you’ll find anywhere in Glasgow. In addition to affordable business hubs and office spaces, our service level always remains top-notch! Who says price has to reflect a certain level of service? flexible lease terms, a high level of client care, personal level of service and absolute resolution to do whatever we can to help support our business tenants to succeed. Save the hassle of refunding parking expenses to staff. Most of our office locations have car parking facilities. For those that don’t, they’re often a stone's throw away from a subway or within walking distance of a bus stop, which lets staff take advantage of Glasgow’s Park and Ride Scheme. Options are available for workshops and office space combined. Others have loading bays if you need to store stock and/or dispatch from your business premises. For businesses in need of office space and storage space, our M8 business complex has 25 offices with flexible storage solutions offered through our sister company ‘Aabsolute self-storage'. Rooms range from 9 sq. ft. to 200 sq. ft. Separating office space and storage space can help minimise overheads by leasing only the amount of office space your business needs rather than lease larger premises than required. ✔ Glasgow’s Choice for Creative Professionals! Glasgow is a vibrant hub of creative professionals. Studio space suitable for artists/musicians are available, as are rooms for live music or arts and crafts. And for those who need both studio space and office space, we can make that happen too. Do you need an office in Glasgow? 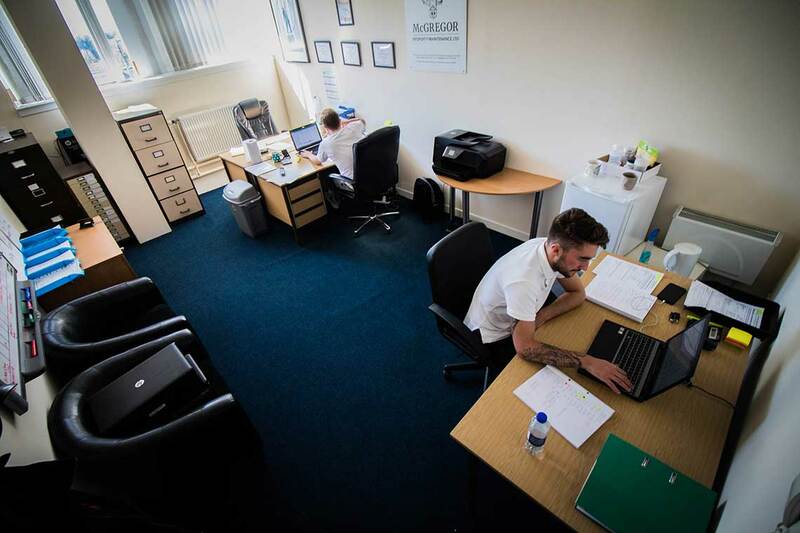 Our office spaces are ideal for many small business owners who are looking to have an affordable base for their business. With a range of offices available all over Glasgow with flexible leases, it is more than possible to grow your office alongside your business. We have car parking available at most of our business centres and there is also unrestricted on street parking. We are close to public transport links meaning you can park and ride from Glasgow. We can offer parking for large vehicles in some facilities. Most our office spaces are suitable for mixed office and workshop use. Some of our centres even have access to loading bays for taking in goods and they also have the option of providing storage facilities for stock at affordable rates and flexible lease terms. Need a studio space ? Need advice finding an office? We will help find the ideal premises for you!